It’s been cold and damp outside for a long time now. Our backyard is in a perpetual state of wetness. The earth is cold and crumbly. The rain stopped a while back, but the mud just hasn’t recovered. I’m painfully aware of the state of my backyard because I have a puppy and a white carpet. Perhaps it was after this morning’s shenanigans where my muddy dog came tearing past me into the house, running laps and dodging my attempted side tackles, leaving a trail of her dirty feet like a horrifying dance-step diagram, that I really started longing for warmer and drier days. She is currently on time out. She seems pleased with herself as usual. It was at 8:30 this morning, on my hands and knees, cleaning up a trail of muddy paw prints, I started fantasizing about luxuriating out in the sunshine and sipping on mojitos and piña coladas. Don’t worry, this story does not take a weirdly uncomfortable and depressing turn. There was no early morning solo drinking (However, if you are on a beach somewhere ordering booze for breakfast, can you please have some for me? Thank you.). I created you a healthy smoothie that mimics some of the tropical flavors of my favorite vacation drinks. 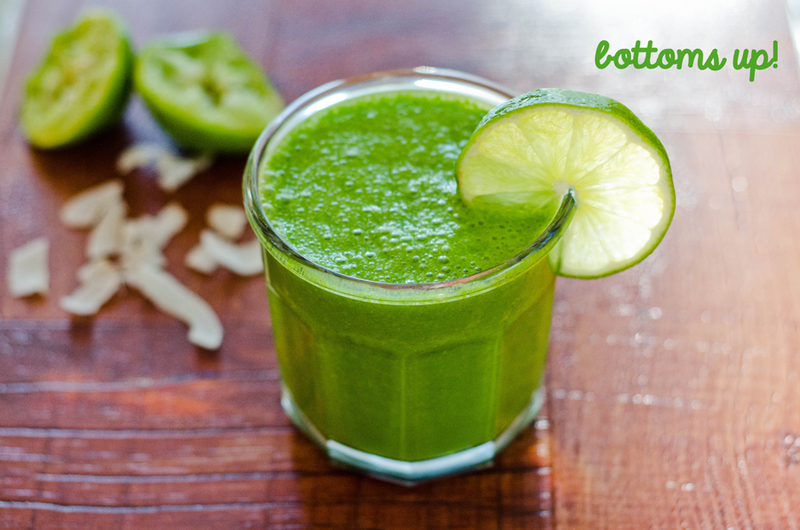 There is lime and plenty of coconut flavor with some sweetness from a nicely frozen banana. I made it green because who are we kidding, we could all use more greens in our diet. 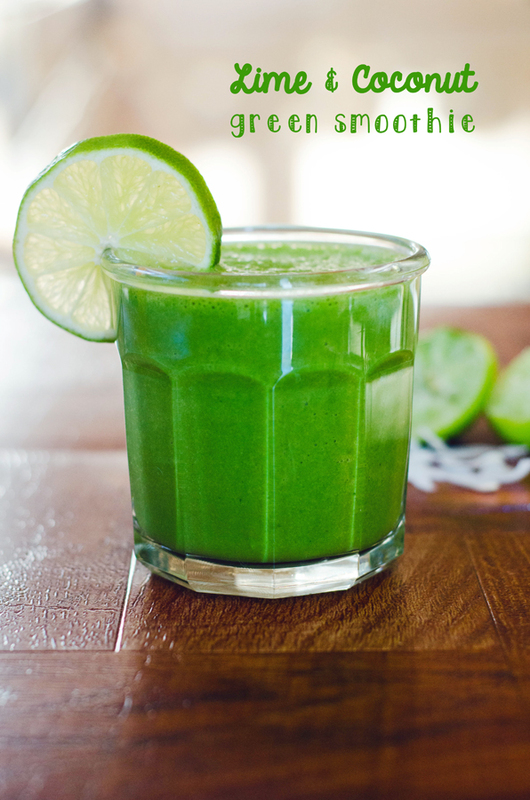 A smoothie is a sneaky way of putting a couple of cups of spinach in your body without realizing it. Hooray! Juice your lime and measure out all of your other ingredients. Layer them together in your blender and blend until smooth. Garnish your glass with a little extra lime if you so desire. YUM! I’ll be making this. Sorry about your white carpets! Eek! We currently have all hardwood and a very docile dog that doesn’t know how to play. So that works out well for us. But she does love to curl up on the couch immediately after coming in from the rain. Which makes for a very stinky couch. White carpets are kind of a nightmare with a puppy. I envy your hardwood!! Your dog sounds like such a lady. I want to meet her someday! Ok, we have had some downer weather days, but you have to admit that today and yesterday were the BOMB! I am so loving this weather and I could just be outside all day. I went for a run in the canyon this morning and I looked up at MT. Tam and just thought about how grateful I am to live here. We are blessed girl! Yaay! I see that you got the ziplist recipe up and running! Ok, this is the prettiest drink and I love that it has lime in it, how refreshing! Have a great night girl! don’t wish all that sunshine! At the moment in Australia it’s topping 40 degrees and I’m mellllttingggggggg. please post me some snow? Oh no. Stay cool, friend!! This is so good! I didn’t have bananas but I was craving something green. So yummy! I’ve made similar smoothies and always felt like I had to force myself to choke it down, but this was so good! I used a whole banana, 3 cups of spinach, and subbed liquid egg whites for the coconut water for some protein. The lime is definitely what makes it! I made this today, and it is delicious! Thank you for such a great recipe!